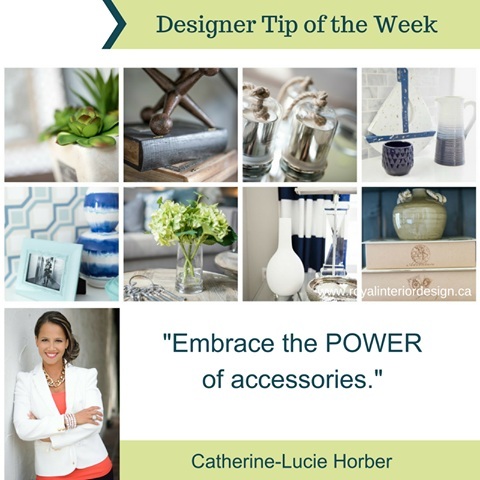 One of the most questioned recommendations I face when designing for clients is the need for accessories! Clients always ask me if they really need accessories? How much of a difference will it make etc. They question it until they see it at the end and then, they understand it. What I say is that it is like wearing an outfit without a tie, or a dress without jewelry, shoes and bag!?!? Can you do it? Sure, but you won't look as good or as well put together! The same goes with your home . Accessories are needed in the right quantity and they need to serve a purpose of either adding texture, glam, tie a colour scheme together or fill up space. It can be functional or simply beautiful to look at, but must always complement the room. It is its purpose! Accessorizing is actually an art that can be mastered with lots of experience, time and practice. To purchase, have the vision and creativity to find the right accent that will complement the space and to put it in the right location within the space that is why our clients often rely and trust on me to do it for them. Combine groupings of 3 or uneven numbers, 1 is not enough, 2 is too perfect and 3 just seems to work better on the eyes. Use different heights: from low to medium and high usually works best. Sometimes you can use the A shape as a guide. You can mix textures and or elements to keep it interesting. Use a large tray and fill it up with things on a coffee table, you almost can never go wrong. Pile things up. A few books and a decorative accessory on top gives height, interest and is great space filler. There are many things you can do when accessorizing, think of colours, textures, materials, combinations, groupings etc and have fun with it! Remember too much of a good thing is also not good choose wisely and tastefully and only use things that will enhance your space not make it look worse or too cluttered.